Difference between revisions of "Unimon"
|desc=Spits a qigong shot from its mouth. 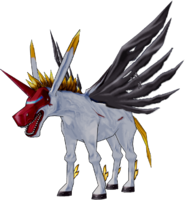 A composite Digimon that has both the horn of the Unicorn, the legendary holy beast, and the wings of the Pegasus. 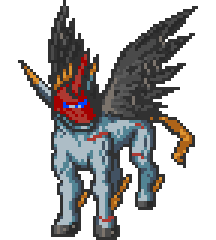 With the gigantic wings growing from its back, it instantly runs about the world of the Computer Network, stabbing enemies with the sharp horn extending from its brow. A wild(?) Unimon has a rough temperament like a restive horse, but once tamed, it can be handled as if it was the tamer's own limbs. 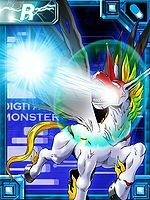 Its Special Move is a Qigong shot spewed from its gigantic mouth (Holy Shot). 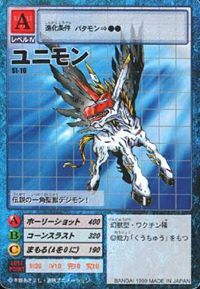 A soaring Digimon which has a form that is a mix of the legendary creatures, the unicorn and Pegasus. Its Special Move is a qigong shot (Holy Shot). — Digimon Adventure: "Roar! Ikkakumon"
| Uni is short for Unicorn (「ユニコーン」 Yunikōn). Anime/Manga Digimon Adventure: "Roar! 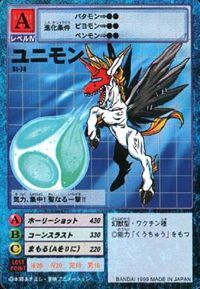 Ikkakumon"
Holy Shot  ホーリーショット Hōrī Shotto Aerial Attack/Horn Blaster/Hail of Horns/Holy Shot Spits a qigong shot from its mouth. 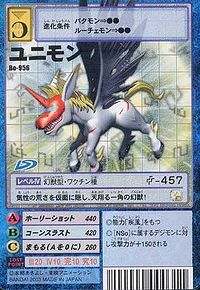 Corn Thrust  コーンスラスト Kōn Surasuto Aerial Gallop/Cone Thrust/Javelin Thrust Gathers energy in its horn and rams it into the foe. 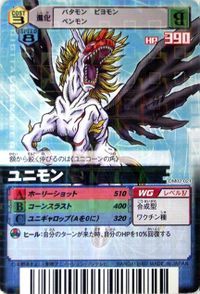 Spread Neigh  スプレッドネイ Supureddo Nei Spread Nails/Supersonic Wave Shoots blades of wind from its horn or soundwaves from its mouth. 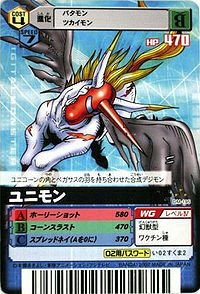 Kicks with its hind legs or charges and stabs the opponent with its horn. After the Chosen Children left Toy Town, they made their way to a natural Hot Spring, where they lay rest for the night. During the night, Jou decides to climb Infinity Mountain without any help from the others. He and Gomamon are doing nicely. Unimon comes flying down to the ridge where the two are standing to drink from a water fall. At the same moment, a Black Gear shoots through the air and lodges itself into Unimon's back. Unimon begins to attack, just as Sora and Taichi come to the rescue with the aid of Birdramon and Greymon. To the surprise of Jou, his digivice begins to start glowing. Gomamon evolves into Ikkakumon and destroys the Black Gear controlling Unimon. 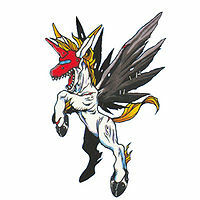 Unimon appears as an obtainable Adult-level Vaccine type Digimon in Digimon World. After the Player recruited Centalmon in the Amida Forest and has opened the Centar Clinic, in the Mount Panorama's first screen lies a weakened Unimon that got its wing hurt. 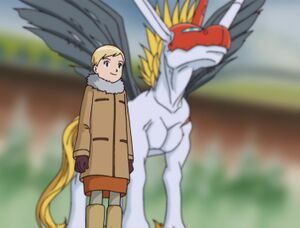 The Player must give Unimon a Recovery Item to heal it, and Unimon will feel better, joining the Village of Beginnings along with Monochromon, Patamon and Piyomon in the Item Shop. 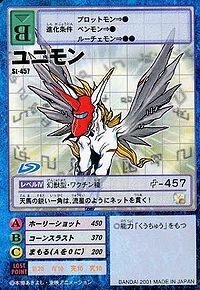 If Unimon is the third Digimon of the aforementioned ones to be recruited, a Card Machine will appear, and if Unimon was the first Digimon to be recruited, it'll build the Item Shop instead. When the Secret Item Shop has been unlocked, Unimon's schedule will coincide that to Numemon's, working from night to early morning. 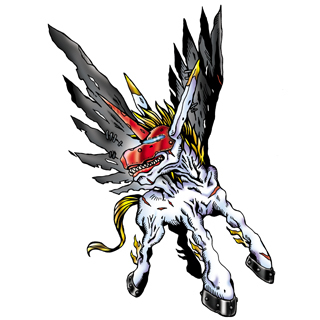 Unimon's Digivolution item is the Unihorn which lets any Child Digimon evolve into Unimon. 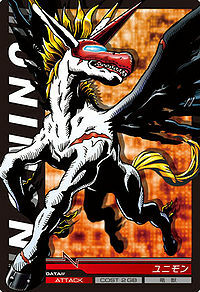 Unimon is a Adult-level and Vaccine Type Digimon. Its basic stats are: HP 160, MP 152, Attack 45, Defense 43, and Speed 32. Its Specialty is none. Unimon evolves from Bakumon (0-2 DP, EL 11) and evolves into Mammon (0+ DP). Its skill is Waking Dream, comsumes 4 MP and is a single-opponent attack. Can be evolved from Bakumon if above level 30, or can be found at Sky Palace. It can evolve to Piccolomon if above level 36. Unimon is an obtainable evolution of Gaomon. Can be evolved from Bakumon if above level 22 and speed 90, or can be found at Highlight Heaven. Can evolve to Piccolomon if above level 33, spirit 145, and Holy EXP 4300. In Sunburst, it'll give you a request mission to see Lilimon in Register Jungle, in order to identify the Mysterious Seed for him. Evolves from Terriermon, Bakumon or Plotmon. Can evolve to Mach Gaogamon, Rapidmon or Mammon. Evolves from Patamon. Can evolve to Andromon. Appears in Area 01 and Area 02 as a wild enemy encounter. 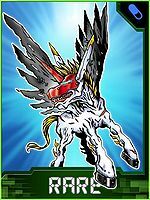 Unimon is an enemy Digimon. 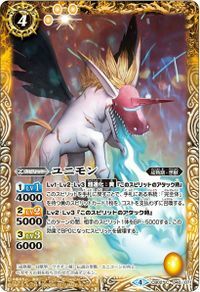 The legendary one-horned holy beast Digimon! Willpower, concentration! A holy attack! 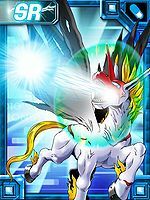 This pegasus's sharp horn pierces through the Net like a comet! This one-horned mythical beast gallops across the skies, hiding its wild temperament behind its mask! 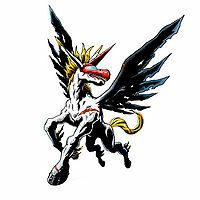 A composite Digimon that has both the horn of the Unicorn and the wings of the Pegasus. Its sharp 'Unicorn Horn' extends from its forehead. This fused Digimon gallops through the sky, as if it were a meteor! 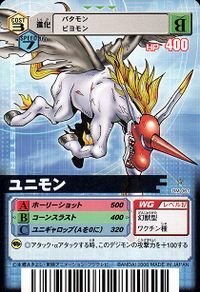 A Composite Digimon that possesses both the horn of a unicorn and the wings of Pegasus. 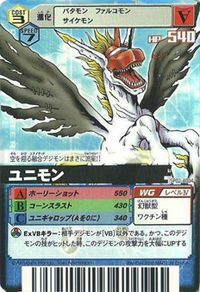 It uses its wings to gallop around the network freely, and uses its sharp horn to attack enemies. It has a very wild temperament. 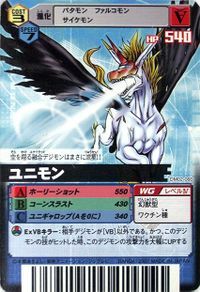 A composite Digimon that has both the horn of the Unicorn, the legendary holy beast, and the wings of the Pegasus.